You can have no idea how badly I wanted to taste that tart when I was 10. Thank you so much for your incredibly nice -- and abundant! -- comments on the last post. I've been blushing for the last three days. I wish I had a blockbuster post to continue my hot streak, but tonight it's business as usual. 1. The asparagus and rice soup from The Zuni Cafe Cookbook is great. Make it. Owen said it was "pretty good" and Mark gave it a 7 out of 10, but I would give it a 9.5 out of 10 and I'm the one to listen to. It's easy and inexpensive and the recipe is here. It's a very brothy so if you have homemade chicken stock in the freezer, use it. 2. On Friday we had a party and I made pulled pork from Make the Bread, Buy the Butter. The first glitch I noticed was that I didn't specify whether the pork shoulder should be bone-in or boneless. BONE-IN. Actually, that was the only glitch. Otherwise, the recipe worked pretty well. Next time you have 12 hours to babysit some coals, consider pulled pork. 3. I'm going to cook from the Time-Life Foods of the World series next. Vintage, out-of-print, still enthralling. These were my first cookbook love and probably, even after all these years, my greatest. I recently started flipping through the books again and wondered why I never thought of doing this before. I'm very, very excited. I was going to make the Tunisian brik from A Quintet of Cuisines tonight, but it looks like I'm going to a high school drama production instead. Like, right this second. Brik tomorrow. In the winter I do pork shoulder with heavy seasoning and homemade BBQ sauce in my pressure cooker. About 80 minutes and its ready to pull. In summer I use an electric smoker for six to eight hours. My kids request it at least a couple times a month. One of my teens ate 15 pulled pork sandwiches in one sitting, and he is about 5'7" and 150 lbs. BTW, Ihave been making a broccoli salad much like SK's slaw for many years. I include chopped bacon and sunflower seeds. HUGE hit at my house. Cooking through your favorite cookbooks from childhood is an awesome idea. When I got married, my mother-in-law gave us a copy of the family cookbook she had compiled as a young mother. I've been cooking through it in on-and-off spurts, trying all kinds of things and having to call her up to interpret ingredients lists and whatnot. Every now and then a recipe will call for a can of Pet milk. That threw me off for a long time. I halfway thought of creating a short-term blog specifically for documenting it. THen I lost steam and forgot about it until you posted this! I just may start that project up again! Oh, I see you are really feeling better. You are heading into exotic territory again. No more comfort food for you! I'm excited, too. Let's go! (Or maybe it should be, you go, I'll watch, heh.) Was it a surprise that you have so many lurkers? I bet it was. It takes a lot of faith to remember that people are reading when they are invisible. I didn't comment on your last post, but your last post made me decide that I would start commenting on your blog. I've been reading for a few years now, but I am just not the kind of person who comments on blogs very much. That may be a characteristic of your readers. But we are out here, reading your work and greatly admiring your writing and your entertaining adventures in food and urban (or suburban) farming. I think cooking from the Foods of the World series is a smashing idea. It will be interesting to see how this classic series has stood the test of time (very well, is what I imagine). I'm looking forward to what you cook from FOTW. I've got the books, but they're on a high shelf and I don't generally drag the chair over to reach them. My go-to shrimp curry is from there, though. I suspect the FOTW will be a trip down memory lane for a lot of us. I know that my mom's shrimp creole, biscuits and cornbread all came out of those books. Awesome - my mom had the entire collection, part of which she's since gifted to me. I love your enthusiasm and can't wait for more results from your trips back into time. I'm looking forward to this project! I had never heard of brik, so of course I immediately looked it up. How have I never heard of this before?? I'm looking forward to learning a lot from these books through your posts. BTW, I like your strategy of "cooking from" a cookbook rather than feeling the need to cook every single recipe in it. In my mother's family, the cookbook de rigueur is the Mennonite Community Cookbook. I grew up with it and received my own copy as a high school graduation present (so I could cook for myself at college, of course). Occasionally I've thought of cooking my way through it, but many of the recipes are focused toward feeding a large farm family, and some are Depression-era expedients that are just plain strange. More than half the book is devoted to baked goods, and those are the ones I love, especially the ones with "very old recipe" or "grandmother's favorite" in the notes. Now you've inspired me to revisit the other sections again... Maybe cast aside my prejudices and cook the ones with the weirdest names, starting with "Wiggle Glacé (An Old German Dish)". Please make that tart. I want to know if it meets your expectations and mine. The recipe is not in the book! Or the supplement! I was horrified. I, too, am inspired to comment on a blog after your "Smitten Kitchen" post. 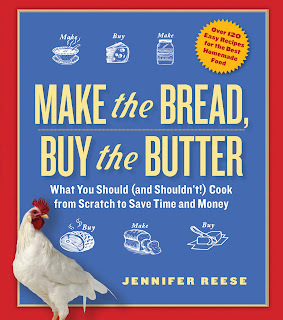 I love "Make the Bread, Buy the Butter", but I have resisted even picking up "Smitten Kitchen." Now on to "Foods of the World": I cooked my way through these cookbooks in college when a good friend subscribed. I remember clearly Dobos Torte, Spanish Wind torte, and sukiyaki. The transforming cookbook series of my youth (we are talking the late sixties) was the "Woman's Day Encyclopedia of Cooking." And my daughter (now 24) would look at all the lovely pictures in "The Good Cooks Series" by Time-Life that I have on my shelves. Picture books really are inspirational. I was looking at that Spanish wind torte and it appeared to be a meringue shell filled with cream. Is that correct? Interesting. I want to try it. Yes, that's it. It's fun to construct; it reminds me of the beehive-shaped clay oven you and your son participated in (and your husband implored you not to make at home). BTW, your summation of The Homesick Texan made run out and buy that book. I grew up in Texas, and I remember the lunch ladies coming around to our third grade classroom (there was no lunch room) selling homemade fried pies for a dime, when we had a dime. Yes yes yes yes yes! I bought those books and have tried to get my children to do reports and cook food from the countries in the series, but so far they have eluded me. But I know there are treasures to be found, I just need to be prepared with the necessary ingredients and time. I am so excited to see what you have to say about this series. That tart looks amazing! Looking forward to your review. Is there some way we can subscribe to your blog so that it comes via email? I'm not so savvy with computers..... Thanks. That was absolutely the book. The kids on the cover, boy in chef hat, pot holders in background, all etched in my memory. What this author says about the castle cake (pictured further down on the page) could have been written word-for-word by me. I didn't have the cookbook, but one of the most impressive children's birthday parties I've been to was one where the mother had that cookbook and let her soon to be 5 year old look at it. He landed on the dragon in a castle cake -- and she made it for him ("with lots of muttering under my breath", she added). That was five years ago now and I'm still amazed. Not really sure what the point of that was. Maybe it was: hey, you should get the book and make yourself the cake! Or maybe it was: don't let nostalgia and over-identification lead you into promising a small child the elaborate cake of his/her choosing. Kristin -- We had that book, too! You described that cake and I could see it immediately. And the pear salad that was meant to resemble bunnies, the strange float drinks, the lollipop cookies. FOTW is going to be fun, fun, fun. Will you make the (apricot??) tart? It looks like it's about as big as a cartwheel, so I'm looking forward to your adventures sourcing a Swiss pony cart. I've got no idea what brik is but dang, it looks good. And, even, something like my own three variable eaters might consume.